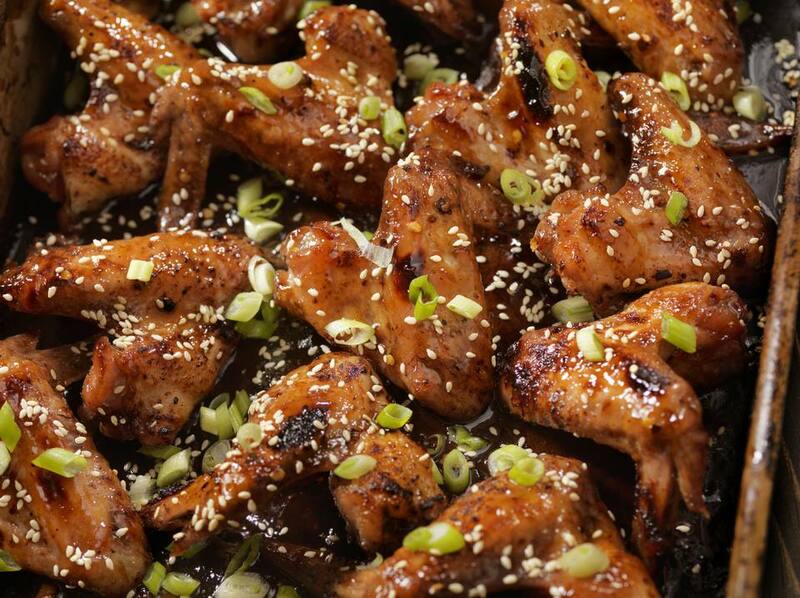 Easy teriyaki chicken wings are marinated overnight and then baked in the oven for a tasty appetizer or main dish. This recipe calls for large chicken wings. If you are using small chicken wings, reduce the initial baking time by about 15 minutes. The teriyaki sauce can also be used as a finishing glaze for baked chicken or shrimp. Combine the soy sauce, balsamic vinegar, brown sugar, garlic, ginger root, and pepper in a small saucepan. Gently heat just until the sugar is dissolved. Remove from heat and let cool to room temperature. Place the chicken wings in a large zip-top freezer bag. Pour in the cooled teriyaki marinade, squeeze out the air and seal. Turn the bag to distribute the marinade over the wings. Refrigerate 12 hours or overnight. Preheat the oven to 375 F. Line a baking pan with foil and place a cooling rack in the bottom of the pan. Place the chicken wings on the rack, cover them with the marinade from the bag and sprinkle generously with paprika. Cover the pan tightly with foil and bake 45 minutes. Remove the foil, raise the oven temperature to 425 F and bake another 15 minutes to brown the skin. If the chicken has not browned, place the tray under the broiler, watching carefully. Combine the soy sauce, balsamic vinegar, brown sugar, and pepper in a small saucepan. Gently boil, stirring constantly, for 3 minutes. Watch carefully so it does not boil over. Remove from heat, stir in the garlic and ginger root and let cool to room temperature. Serve the remaining sauce on the side. Use a dry saucepan or frying pan to toast the sesame seeds, stirring constantly over medium heat until golden. You will notice there is a bit more brown sugar in the dipping sauce, so be sure to measure properly.